This study investigates why some dairy farmers join cooperatives while others are reluctant to join or drop out, in spite of the perception that cooperatives help in eradicating poverty. Also, the study investigated the benefits and chal-lenges of being in the cooperatives. According to United Nations (2009) coop-eratives ―play a meaningful role in uplifting the socio-economic conditions of their members and local communities‖. Despite the much touted benefits as-sociated with the cooperatives some dairy farmers are still reluctant to join. This raises a lot of questions, for example (i) why do some farmers join?, (ii) why do other farmers refuse to join ? and (iii) are cooperatives really useful to their members?. Thus this study helps to reveal some of the reasons for and against joining the cooperatives and presents the benefits and the challenges of participating in the cooperatives. The study used the survey methods to extract primary data from the re-spondents who included dairy farmers both within and outside the coopera-tives and key government agents. It also reviewed literature about cooperatives from journals and articles from major organisations. 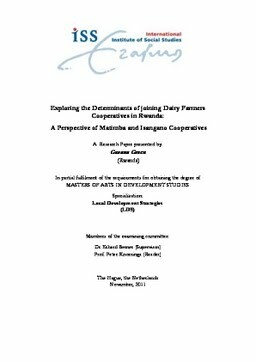 Matimba and Isangano dairy cooperatives were used as case studies. According to the findings, farmers join cooperatives because of various reasons. Among the prominent reasons are; the need to access markets and agro-vet services and access training opportunities and the need to work with others. The study established that some farmers have not yet joined because; they could not afford membership fees and because of the poor performance of the cooperatives and lack of awareness out the cooperatives. Other key findings present benefits of the dairy cooperatives and the chal-lenges they face. For example members are able to access markets and agro- vet services and they access training opportunities. Major challenges include; irregular market, low milk prices and severe weather conditions, and lack of water shortage and lack of access to feeds, and low participation of members in some cooperative activities.